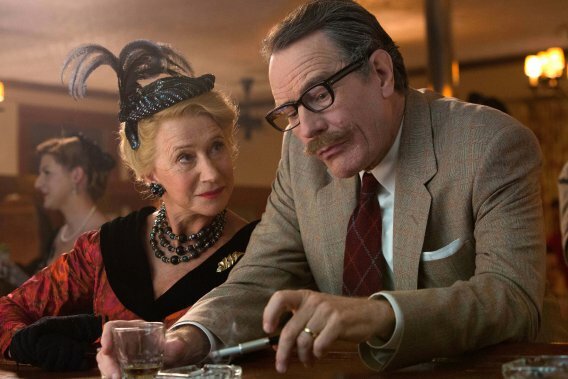 Helen Mirren as Hedda Hopper and Bryan Cranston as Dalton Trumbo in a scene from "Trumbo." (by Allan H. Ryskind, NYPost) – Screenwriter Dalton Trumbo, the heavy-duty Hollywood Stalinist, has undergone a pleasant face-lift thanks to Hollywood. The film “Trumbo,” released today, features Bryan Cranston of “Breaking Bad” fame and is directed by Jay Roach, who also directed the popular Austin Powers movies. Trumbo was one of the famous Hollywood Ten, those blacklisted by the studios for refusing to tell the House Un-American Activities Committee in 1947 whether they were party members and working for Moscow. They were, but the film has given them all a major makeover and turned Trumbo into more Mother Teresa than Karl Marx. Judging from the movie, he was never a “wicked Commie,” as red-baiters Hedda Hopper and John Wayne would have it, but an American patriot who was driven to end the Hollywood blacklist that affected so many of his screenwriting colleagues. Almost single-handedly, he succeeded and struck a mighty blow for freedom and the cherished First Amendment. Some things are overlooked, of course, such as Dalton’s slavish loyalty to Stalin from the late 1930s until the Caligula in the Kremlin died in 1953. Stalin may not have been perfect, Trumbo would later admit, while insisting that the serial killer in Moscow had done wonders as he “preserves, maintains and develops” socialism. His embrace of Adolf Hitler is also nicely airbrushed. During the 22 months of the Hitler-Stalin pact, Dalton sided with the Fuehrer as he attacked Poland, stormed across Western Europe and then blitzed London in preparation for a cross-channel invasion. Dalton mobilized his polemical skills to ease Hitler’s burden of conquest by demonizing his enemies and insisting that England was just not worthy of assistance. He even accused FDR of “treason” and “black treason” for aiding the British in their hour of peril. That was the party line from Moscow, which Dalton emphatically echoed. Not until the Nazis marched on Russia in 1941 did he find the German warlord a major disappointment. The authentic Trumbo, not the Botoxed movie version, used his inexhaustible supply of energy to advance not the First Amendment but totalitarian Communism. He secretly joined the Kremlin-controlled Communist Party in 1943 but conceded to biographer Bruce Cook in the 1970s that he “might as well have been a Communist ten years earlier” and that he “never regretted it.” He loved the party so much that, after serving a prison term for contempt of Congress and a sojourn in Mexico, he “reaffiliated with the Party in 1954” and then left the party in 1956. For approximately two decades, Trumbo was secretly working for the Evil Emperor. But his pro-Soviet views were hardly hidden when in 1945 he became editor of The Screen Writer, the official publication of the powerful Screen Writers Guild, transforming that influential monthly into a virtual Red propaganda organ, with the aid of CP members Gordon Kahn (managing editor) and Harold J. Salemson (editorial secretary). Virtually everything Red was celebrated, including Communist lectures, Communist obituaries, the Soviet film industry, Red-run unions and guilds, party screenwriters and even Stalin himself. By 1947, Americans knew that Stalin was our deadly enemy. But Dalton and the rest of his Hollywood Ten crew were colluding with the Kremlin to do this country in, which the much maligned HUAC proved beyond reasonable dispute. For this reason only, the studios blacklisted those Soviet fifth columnists who worked long and hard and covertly for a Stalinist America. Trumbo was one of those who very much earned his banishment. It should have lasted longer. Allan H. Ryskind is the son of Hollywood screenwriter Morrie Ryskind and the author of “Hollywood Traitors: Blacklisted Screenwriters — Agents of Stalin, Allies of Hitler.” Posted at NYPost on Nov. 6, 2016.